As requested, ALL of my FORMS OF ENERGY units in one complete bundle! 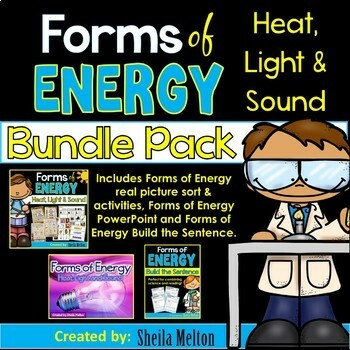 This bundle features real pictures of forms of energy to sort with recording sheets, Forms of Energy PowerPoint and Forms of Energy Build the Sentence - the perfect combination of reading and science for young learners! This is a great addition to your Forms of Energy curriculum and will add discovery and excitement to your Science Center! Please click the PREVIEW button above for a detailed look at this unit. Energize your students with this interactive Forms of Energy PowerPoint using all real pictures! It includes several opportunities for students to apply what they are learning through questions as well as 6 review question slides at the end to assess student knowledge. 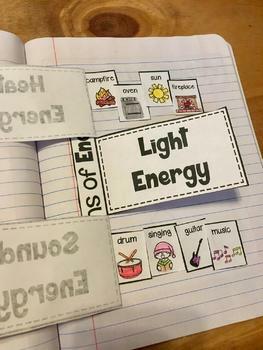 Heat up student learning with these Forms of Energy real pictures to sort, printables and activities! 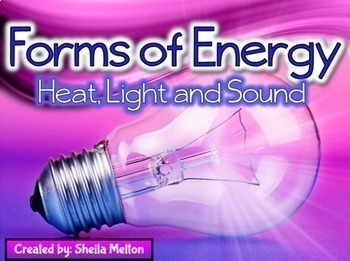 This is a great addition to your Forms of Energy curriculum and will add discovery and excitement to your Science Center! Students can sort the real picture cards under the correct energy header card and complete any one of the included printables. Pictures come with and without picture labels. Draw a picture of a each form of energy, label it and describe what energy is and why we need it. Draw an example of each form of energy and write 3 facts you learned about energy. 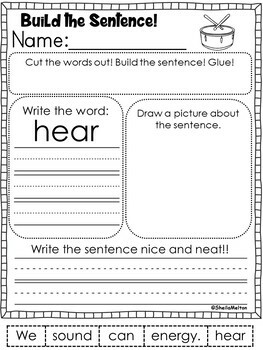 20 Build the Sentence printable worksheets using words and themes all about Forms of Energy! The perfect combination of reading and science for young learners! These NO PREP printables are ready for you to print and go! These print and and go printables are perfect for morning work, homework, small group, centers, Science center, stations, individual practice, literacy tubs, sub plans, 5-minute fillers, or early finishers. -Cut out the words at the bottom of the page. -Build the sentence on their desk (a great time to remind them about capital letters at the beginning and punctuation at the end). -Glue the sentence in the correct order on their page. -Practice writing the sight/dolch word in the box. -Draw a picture about the sentence. -Practice writing the sentence nice and neat. ©SheilaMelton. All of the activities included in this unit are the intellectual properties of Sheila Melton. This resource is for classroom use and is intended for the purchaser. Duplication for other classes, by other teachers or for use in wide distribution such as a school district or on the internet, is strictly forbidden unless multiple licenses are obtained. You may not re-sell or claim this product as your own. Violations are subject to the penalties of the (DMCA) Digital Millennium Copyright Act.